In Darkness We Shine was photographed during an extraordinary sunrise 20 miles Northwest of Orla Texas in Mid November 2018. 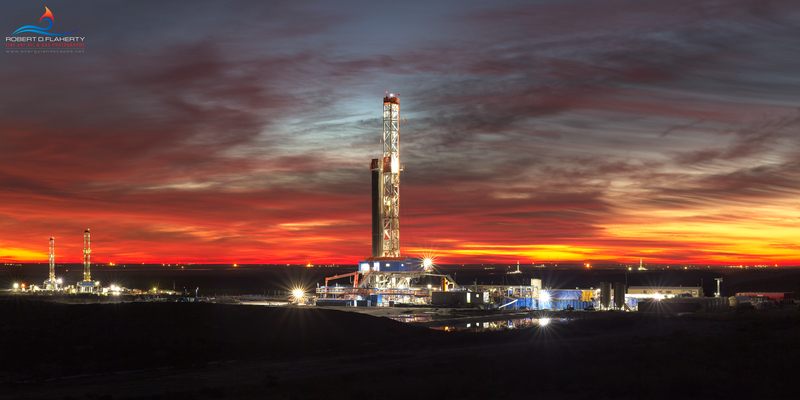 The image features Chevron's advanced horizontal pad drilling operations Northwest of Orla Texas. The three Patterson UTI drilling rigs will spend up to a year on each pad drilling multiple wells. The image is available as a 3:1 or 2:1 panorama as well as a standard sized image featuring the lead drilling rig. The 2:1 panorama is composite using 63 high resolution photographs blended to one 4 billion pixel image.